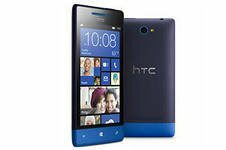 HTC Windows Phone 8S A620e is an advanced model of the smartphone operating system MS Windows Phone 8. The smartphone has a capacitive touch screen with a diagonal of the screen 4 inch with resolution 480 x 800 dpi. Has a good camera 5 megapixel camera with led flash and quality autofocus. Making images look decent quality. Memory of the smartphone 4 gigabytes, but there is a possibility of installation of memory card microSD. Also smartphone provides the full support of Bluetooth, Wi-Fi, 3G, GPS and GLONASS. Has a small weight only 113 grams, and the compact dimensions of which are: 63 x 120.50 x 10.28 mm Battery capacious its capacity of 1700 mAh.